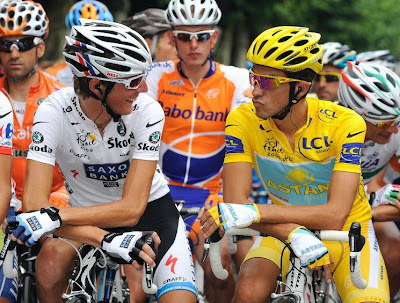 As we pass the half-way mark of the Tour de France, the battle for the coveted Maillot Jeune, the yellow jersey, is down to only two men – Alberto Contador and Andy Schleck. Ahead of the tour, it was expected to be between these two, and as the other contenders have fallen away through the punishing Alps, so it has developed. 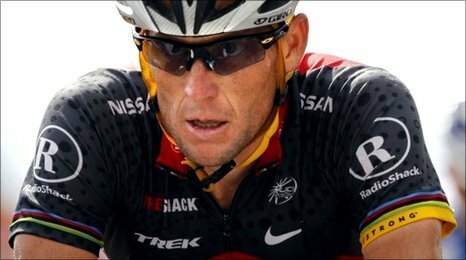 There was to be no fairytale ending for Lance Armstrong, no British challenge from Bradley Wiggins and Team Sky, Cadel Evans fell away in the Alps, and no other rider has come through to challenge for the victory. Following his announcement that this would be his final Tour de France, attention on the 7-time winner Lance Armstrong was even more intense than usual. His exceptional performance in the Prologue, where he finished fourth ahead of Alberto Contador, suggested that maybe there was still a final push left in him. However, following Stage 8 up to Morzine-Avoriaz, he admitted defeat in his attempt. Having fallen twice, he was unable to hang on to the leaders as they stepped up the pace up the mountain, and he is now over 17 minutes adrift of the yellow jersey. Having come from nowhere last year to finish 4th, Bradley Wiggins was hoping to mount a major challenge this year. 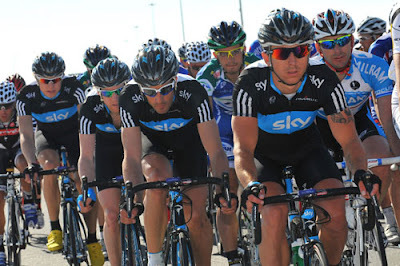 Supported by the newly established Team Sky, hopes were high, but performances have not lived up to expectation. The injury to team-mate Simon Gerrans was a big blow, as Gerrans was picked specifically to assist Wiggins in the mountain stages. He lies over 7 minutes adrift, and has now set his sights on securing a top-10 position when the Tour rolls into Paris. 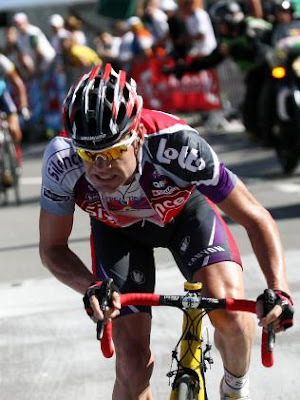 The two-time runner-up, and reigning World Road Race champion, Cadel Evans was another who had hopes of finally capturing the yellow jersey. He was able to stay with his competitors on the gruelling Stage 8, but was dropped on the following day at the 160km mark. He later revealed that he was riding with a fractured elbow, which had virtually destroyed any hopes he had of securing the victory that he so desired. Thus, it has boiled down to an intriguing contest between the two pre-race favourites. Alberto Contador is the reigning Tour de France champion, and in many eyes, one of the best stage riders there has been for many years. He is one of only a select few to have won all three Grand Tours – the Tour de France, the Giro d’Italia and the Vuelta de España. Andy Schleck is the young pretender. Hailing from Luxembourg, he finished as runner-up last year, and many felt he could have mounted a greater challenge to Contador had he not supported his elder brother, Frank, so much on the climb up the Ventoux. The withdrawal of Frank this year after Stage 3 with a fractured collarbone could prove a blessing in disguise, although his support in the Pyrenees will be missed. Andy Schleck currently wears the yellow jersey, 41 seconds ahead of Contador. However, Contador remains the favourite at this stage, since he is a far superior time-triallist than Schleck. Realistically, Andy Schleck needs to establish a lead of at least 1m45s before the individual time trial to give himself a chance of holding off the Spaniard. 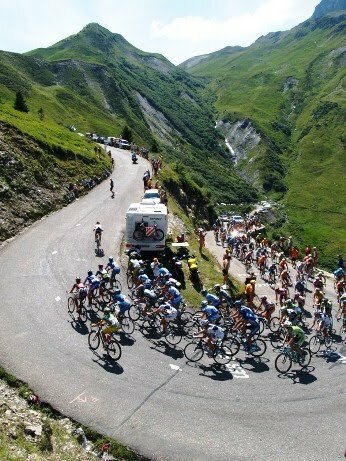 As a result, the crucial stage that will determine the Tour is likely to be Stage 17 from Pau to the Col-de-Tourmalet. Tourmalet is a mountain-top finish and will be the opportunity for Andy Schleck to gain the time that he needs. Stage 9 has already provided a preview of what we might expect, where Andy Schleck repeatedly tried to attack Contador up the slope, before they eventually decided to work together to put distance between themselves and their rivals. However, Andy Schleck will have to repeat this, and break-away from the Spaniard if he is to have a chance to win overall. The absence of his brother could prove crucial here, unless he can enlist the help of some of the other riders who are looking to boost their position in the general classification – the likes of Roman Kreuziger, Ivan Basso or Jurgen Van Den Broeck could be possibilities here. At the current moment, Alberto Contador rightly remains the favourite, but Andy Schleck is making it into an intriguing contest. Even if this is not to be his year though, only a fool would bet against him eventually realising his potential and winning the biggest race in cycling.